GOSTD Tennis Loam at Devonshire Park Lawn Tennis Club, Eastbourne. Danny Negus, Head Groundsman. Devonshire Park Lawn Tennis Club, Eastbourne. "I have used Surrey Loams GOSTD 125 for many years now & have always been impressed by it's consistency in both quality & performance on all our cricket squares." Mark Jolliffe, Head Groundsman, Taunton School, Somerset. "GOSTD 125 has been my choice of cricket dressing since 1995, I know I am going to get the same quality year on year." Richard Ayling, Grounds Manager, Merchant Taylors School. "I have used GOSTD cricket loams as a first class groundsman for many years because the quality of the material is superb & consistent year on year." Andy Mackay, Head Groundsman, Sussex County County Cricket Club. "I have used Surrey Loams GOSTD products for many years at various locations, always with outstanding results. They have helped to achieve true, firm surfaces on my cricket squares & tennis courts." Steve Fidler, Head Groundsman. St James Senior Boys School, London. "As long time partners, Surrey Loams Ltd has been key to success at Twyford House CC where we provide firm wickets with a consistent bounce that supports a good level of competitive cricket and wickets that allow developing young cricketers to bat with confidence. " Sean Neville, Head Groundsman, Twyford House Cricket Club. "We have successfully used GOSTD from Surrey Loams Ltd for over thirty years to produce quality pitches." Chris Westbrook, Grounds Manager, Hursley Park Cricket Club. "I've been using GOSTD SuperNatural & GOSTD 125 from Surrey Loams Ltd for 20 years & they consistently produce top results." Philip McCormick, Head Groundsman, Northern Ireland Civil Service Sports & Social Club, Stormont. "England coach Peter Moores & former captain Michael Vaughan believe the wicket at Emirates Old Trafford is one of the best in world cricket!" Matt Merchant, Head Groundsman, Lancashire County Cricket Club, Old Trafford. GOSTD Cricket Seedbed Loam for Cricket Wicket Construction is made using the latest technology and specifications. Our GOSTD Cricket Seedbed Loam for Cricket Wicket Construction is made to the same exacting standards as our highly recommended Cricket Top Dressing, to ensure perfect compatibility throughout the construction process and promote good root growth and a healthy sward. If you have any questions regarding the use and application of our dressings call us FREE on 0800 500 3900. 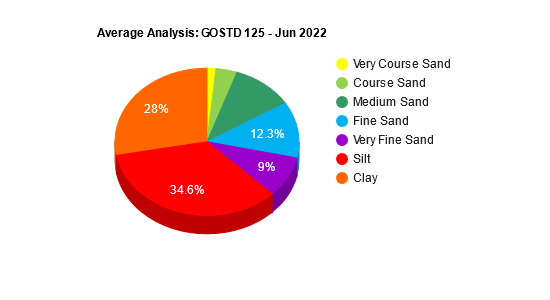 These analysis results are averages and should be taken as a guide only, individual results will vary slightly due to the raw organic nature of the materials used in the manufacturing process. To request a FREE sample of this or any of our Cricket Loam products please use this form. Thank you for submitting your sample request. We aim to fulfill get your sample to you within 3-5 working days. Should you require more than this single sample or your request be more urgent please calll us, our contact details can be found at the bottom of most pages on our website.